Gangtok is a small city situated in a highland area where 30% of its boundary borders neighboring countries. It is the capital and the largest town of Sikkim and is located in the eastern Himalayas, at an elevation of 1,650 mIt is a landlocked state and 44% of its land is covered with forest. Because of its geographical features, the city requires environment friendly management due to its limited carrying capacity. Tourism is currently the main source of income of the Gangtok municipal area. It has banned the use of pesticide and chemical fertilizer for nearly 13 years, and has received certification as an organic farming state. Environmental management is the main concern of Gangtok; the city has been dealing with solid waste issues for quite some time. According to the Zero Waste Himalaya Group, around the late 90s, plagued by irresponsible waste dumping, the State Government took a couple of bold decisions that brought a sea of change in Gangtok’s waste situation, and it all started with a ban on the use of plastic bags. An amendment in the ‘Sikkim Trade License & Miscellaneous Provisions (Amendment Rules, 1998)’ that disallowed traders from using plastic bags when selling their goods, brought down plastic bag usage drastically in the state, and this initiative helped build Sikkim’s green image. In 2016, two significant decisions aimed at reduction in waste volume were announced by the State Government. One notified the citizens of a statewide ban on the use of polystyrene disposable cutlery, which is non-recyclable as well as a health hazard, and the other ban was on using plastic bottled water in Government functions. Although these rules are still facing huge challenges to their implementation, mainly due to lack of awareness, they have showed the government’s willingness to lead the way in following the principle of reduction. 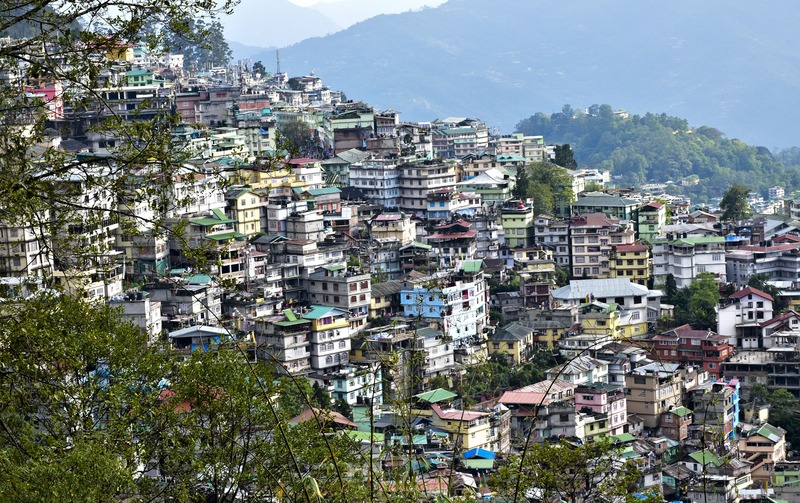 “Problems in hilly areas are very different from those in other areas; we don’t have a landfill site in the city and we don’t want to dump the waste in neighboring areas.” Shakti Singh Choudhary, Mayor of Gangtok shared why Gangtok is striving for 100 percent door-to-door waste collection and segregation. “We are trying to ensure that minimum waste reaches landfills. Our goal now is to make Gangtok a zero-waste city,” he added. As a young state with low connectivity to the rest of the country, the city needs more exposure to the latest technology and funding opportunities to build resilience. Despite the fact that public financing mechanisms will never be enough to support resilience practices, cities in Asia are continuing to struggle to find the right approaces to involving the private sector. “In order to attract funding from the private sector, the city needs to better articulate their city planning. The city needs to prioritize which projects should be implemented to tackle which problems,” said Susan Jose, Environmental and Resilience Specialist of Cities Development Initiative for Asia (CDIA), during the Resilient Cities Asia Pacific Forum 2017. Data are also another key to ensure funding, whether from the private sector or international agencies. “What vulnerabilities that the city has experienced, what opportunities exist, and what kind of needs they have identified,” added Sunandan Tiwari, Senior Manager of ICLEI. Sadly, bureaucracy continues to be a major challenge for the city to come up with more innovative solutions. Whether we like it or not, funding mechanisms are highly dependent on the commitment of a city’s leadership to enable resilience measures. “Ideally, the city needs better regulation to reinforce partnerships between stakeholders for financing resilience,” said Ruth Erlbeck, GIZ Nexus Project Director, as she emphasized the importance of commitment and leadership to lead better financing resilience mechanisms. More importantly, “Every local community must have the same understanding about what problems are faced by the city, otherwise any urban resilience practices will not work," said Shakti Singh Choudhury, Mayor of Gangtok, as he emphasized the involvement of all communities to ensure not only funding but also translating it into practice.